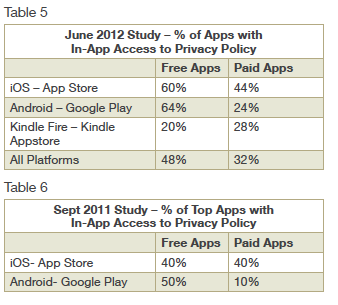 The Washington, D.C.-based think tank Future of Privacy Forum (“FPF”) released a study this week detailing the current state of mobile app privacy policies as of this past month, June 2012. The report found that many app developers are now responding to the increased pressure from U.S. regulators on this issue, and have now introduced privacy policies for their applications as well as new policies surrounding the use of customers’ private data. In February, the FTC released a report which has a specific emphasis on mobile apps targeting children, where it stated that app makers on both the iOS and Android platforms were doing very little to properly inform consumers about their data collection practices. The FTC stressed that without this information, there really isn’t a good way for parents to make smart choices about the applications they allow their children to download and use. Parents and children aren’t the only demographics affected by consumers’ lack of information and understanding around personal information privacy, of course. 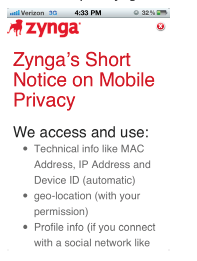 As we also discovered back in February, apps that had access to private address book data, like Path, weren’t taking sufficient precautions with user data. Subsequent outrage ensued. The Path problem blew over, as these things tend to do, but government’s involvement in the matter did not. In addition to the FTC, the California Attorney General’s office indicated in February that it would enforce California’s Online Privacy Protection Act against app developers. Apple, Google, Microsoft, Amazon, Hewlett-Packard, and Research In Motion all agreed that they would require developers to include privacy policies in their apps, so users would be better informed about how their data was used. At the time of the announcement, there was no specific time frame given as to when the companies would need to be in compliance, but California Attorney General Kamal Harris said her office would revisit the situation in six months time. In June, Facebook signed a similar agreement with the AG’s office, covering all the apps in its App Center. And earlier this month, the National Telecommunications & Information Administration in the U.S. Department of Commerce announced it would host a series of meetings concerning mobile app privacy, with a focus on developing an appropriate code of conduct. So what’s changed? As noted above, apps privacy protections have increased on the top two platforms, iOS and Android for both free and paid apps. 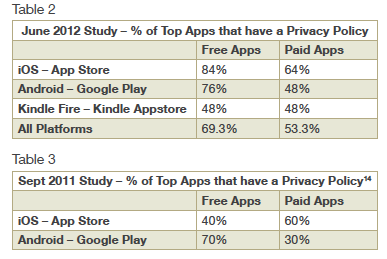 The study also found that of the top 25 free apps on iOS, Google Play and the Kindle Fire Appstore, 48% made the privacy policies available within the app. Free apps show significant improvement here. The report even looked at apps which requested precise user location data in particular to see if they had privacy policies. Here, 12 out of the 50 apps surveyed on the iOS App Store platform requested precise location information and 10 out of those 12 had privacy policies. 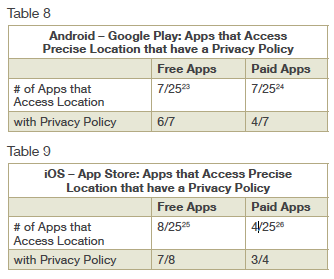 14 out of the 50 apps surveyed on Google Play requested precise location information and 10 out of those 14 had privacy policies. While things are clearly improving thanks to the government regulator scrutiny and further push from the app stores themselves, there are still some laggards here. While it’s not clear when and how app stores will force developers to be in compliance with the new rulings, many have obviously decided to err on the side of caution.